Your backyard is full of building waste from the reconstruction of your house? So why not benefit from our professional rubbish removal North West London NW company. Better Cleaning Company provides reliable and affordable home and office, garden and after builders waste disposal as well as recycling. Call up 020 3746 3201 or submit online request for a free of charge viewing for an exact price estimate now! 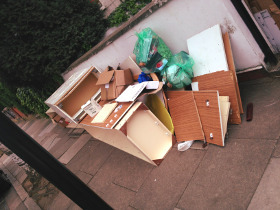 Rubbish collection service North West London is a complex service that we promise to execute quickly and safely. Once the service is organized for you, expect to have visitation by our expert and trained specialists. They will come to your house for examine in advance and make you an offer for a specific date for the procedure and the finalized price. Please, be aware that the rubbish removal services we provide are not hour-based or with fixed prices. We specify these details after the initial check. Once the customer and the rubbish removal team agrees on them, we arrange the treatment. We offer effective and reasonably priced garden waste collection North West London NW, loading & disposal. Our rubbish collectors are specialised in swift and proper green waste removal, brown waste removal and also waste recycling or dumping. They will certainly collect any grass or hedge clippings, branches, leaves, twigs for you and dispose of it in lawful and proper manner. Better Cleaning Company is an experienced cleaning and junk removal company in North West London with a very delicate technique to each individual client. We are consistently dedicated to the particular demands and requirements a customer comes to us with. This is why our removal services are always so effective and well liked. Arranging removal for you will be entirely performed to your deadlines, needs and administrative demands. We will certainly pack the luggage for you and we will give you even the packing items. We will find man and van for the moving and will be very attentive for your personal valuables - specially for fine art, precious items, decorative home furniture and hand-made indoor goods. In all scenarios we secure not only the packing procedure, but also the suitable boxes arrangement through the travel. If you want personal travel help - like tickets, quickly accommodation or administrative help with the relocation, we can assist you, as well. If you need to reserve our excellent quality rubbish removal services North West London NW, you should contact our 24-7 phone line 020 3746 3201 or submit an online booking form for a free viewing or perhaps directly buying our service. Better Cleaning Company ensures a fast arrival of our experienced 2 men squads at your doorsteps. They will examine the volume of the squander, and will give you a price quote right away. Loading & collection will commence right after that. As a licensed rubbish waste carrier we at all times do the recycling on your behalf.